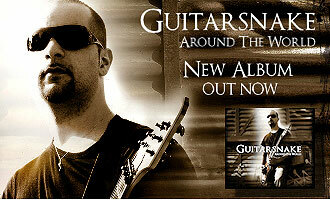 mwe3: Congratulations on this amazing new Guitarsnake CD Nicolas. 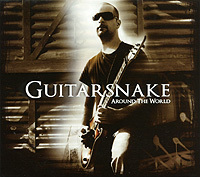 What was the motivation and inspiration behind writing, producing and recording the 2011 Around The World CD by Guitarsnake? NICOLAS NOTARIANNI: Thank you mate! Since the release I am still very surprised by the cordial welcome for my album Around The World, especially in the United States. It's really a great honor for me. To answer your question, when I made my first album One Life Is Not Enough alone at home, I did not think at that time that I would make a second album. Oline allowed me to meet a lot of musicians in France and abroad. With I Have A Dream fans discovered me. On the CD, I wrote "Somewhere In This World". I felt most frustrated at not having written before. I think it motivated me with at the time to do a second album with a lot more work on writing songs. mwe3: Your guitar work on the Guitarsnake CD sounds very influenced by 70s progressive rock guitar heroes like Mike Oldfield, Janne Schaffer as well as the 60s guitar heroes like Hank Marvin, in some places. Looking back, who were some of your significant guitar influences and other musical heroes and can you name some of your favorite albums or recordings? NN: It's funny what you say, I've never done this comparison. I try to listen to all kind of music since childhood. I think there are things that I play unconsciously and which can remind you of players that I have never listened to. I love progressive music for its musical richness. But you know, I'm a guitarist who played and was marked by the 1990s. I grew up with Nuno Bettencourt, Slash, Patrick Rondat, Joe Satriani, Steve Vai, Malmsteen, Van Halen, Lukather, Petrucci, Vitto Bratta. There are so many that I like here but those are just legends to me. My music is made of all of this and others, guitarist or not. I'm looking for emotion while listening to music. The thing that will makes you tremble. Then if I give you my favorite album, I try and I try believe me! But I'll give you three. III Sides To Every Story - Extreme, Tambu - Toto, and the instrumental Amphibia - Patrick Rondat. mwe3: Can you say something about how you describe your guitar technique? When did you start playing guitar and can you remember your first guitars? NN: I started playing guitar at the age of nine, self-taught after leaving the trumpet after twelve years of conservatory. My first guitar was a classic one that my uncle had given us, to my brother and I. She had acoustic strings on it. It was horrible to play. I did not keep long because it was unplayable. I knew at that time I had to do something with this instrument. I learned it watching my brother who was playing guitar at that time. Then, I started working my ear to transcribe what I heard, and then I'm in tabs, instructional videos. My guitar playing developed over time by working the different techniques of my favorite guitarists. mwe3: What guitars are you playing mostly on the Guitarsnake CD and can you say something about your amps, strings, picks and what pedals or effects do you prefer and use live and in the studio? NN: I had a lot of guitar in my hands before the album Around The World. 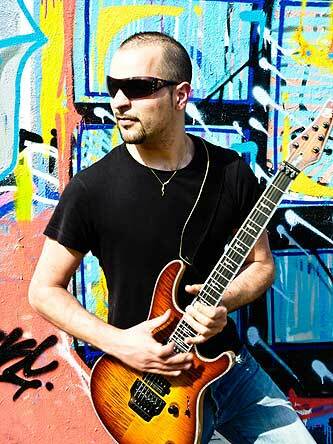 After the release of Oline I got the endorsement with Mayones guitars and basses which has produced two models, Regius Pro. I recorded the album with these two models. I use an ENGL Invader 100 and a Torpedo VB-101 (Two Notes) for recordings and live. It's just incredible! For the effects I use my TC Electronic G-System, strings by D'addario and I use picks Jazz III. mwe3: Do you follow the advances and news in the guitar world and is there any other guitar news that youd like to tell the readers about? NN: I love the untypical guitarists as Guthrie Govan, Ron Thal and Matthias Ia Eklundheven if their guitar playing has no bearing on mine. I think we each have certain benefits and challenges to practice an instrument. Everybody has his physical limitations, I think too. The guitar like other instruments has so advanced these last years and that is sometimes even scary, sometimes it is even inhuman. The aliens are among us! YouTube is evidence for that. But I admire because I would like to understand their ways of thinking about music. If I had to say something to the readers as you ask me, I would simply say that it will evolve anyway, every day practicing his instrument. Everybodyto each his own rhythm, its physical limits, the music should not be a ground competition, the music is a universal language and it should remain so. If there is no emotion, there is no music. mwe3: You perform all the guitars, keyboards and even some of the drums too on the new Guitarsnake CD. Can you describe the challenges involved in performing and recording all the other parts as well as guitars on the CD and can you tell us what other musicians played with you on the album? NN: This is a big challenge and many hours I confess! This was a big challenge, definitely and I spent many hours doing this but it was fabulous! Im really proud of this album because this is the culmination of my work. I invited Dave Rimmer to London for recording bass. Before his arrival, I took care of the rhythm guitars, keyboards and drums with Laurent Reinling. We recorded the bass in one afternoon. The weather was fair but we have done what we wanted. I recorded my solo at the end. The hardest part for me was the integration of the orchestra on some parts and make the mix homogeneous. mwe3: Also are you planning to perform the music from Around The World live at any point in the future and what musicians do you play with live? NN: To be honest, it is very difficult for a musician with a self-produced instrumental album in hand, to perform in France. We have many good musicians, signed or not, in our country but not a culture quite open about this kind of music here. It's too bad! The French prefer the stars coming out of programs such as "TV-reality." Its up the creek for me, tell me! mwe3: How did you start working with the Finland-based Mad Guitar Records label? Theyre doing fantastic things for the instrumental guitar genre. Also can you say something about the two tracks that end the new Guitarsnake album and how they enhance the CD? 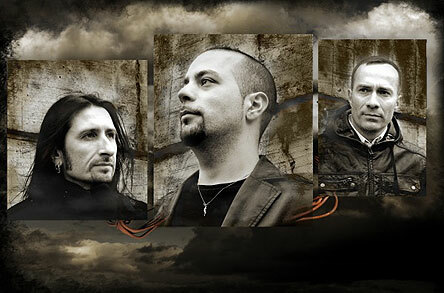 NN: I've worked with them before on the Mad Guitar Records compilation, Melodic Soloists. I have been in contact by chance with the MySpace page "Guitarsnake Street Team". United States thanks a fan. I was proposed to be included in the compilation among other great guitarists. I humbly responded to the invitation. Then, I invited back Roo of Mad Guitar and other friends on a remastered version of On The Road. I included these two bonus tracks in the album because the fans loved the first versions. I really wanted these two to be remastered because I felt a little ashamed of the first CD! As for Mad Guitar Records for these records, I was looking for a label, but not French. France is unfortunately not a country for this kind of music as I have said. I really wanted to give this album an international value and not a French one. mwe3: What are your plans involving promoting and publicizing the new Guitarsnake album and what about other plans, recording or performing moving forward into the future? NN: Since the release of Around The World we did a lot of promotion on radio in France. A big part of the promotion was the realization of the clip Around The World. We will have a show soon in Paris. But I wish I could do concerts outside of France. To be serious, a few weeks after the release of Around the World, I was invited on the album Guitar Addiction - "A Tribute To Modern Guitar." It is a beautiful album which includes some fifty international artists (Mr. Fastfinger, Ron Thal, Matthias Ia Ecklundh, Stuart Hamm, Christophe Godin, Roo, Tristan Klein, Kenny Seraneand I was honoured to be invited there. mwe3: Thank you Nicolas. Best wishes to you, Guitarsnake and Mad Guitar Records. NN: Thank you to you for this interview and the time you spent on me. I hope to see you soon! mwe3: How did you come to know Guitarsnake and decide to release it on Mad Guitar Records? 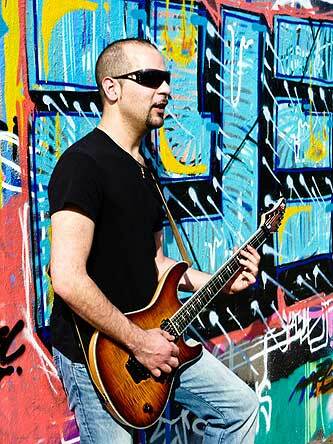 ROO CHAPUS: During the production of the compilation Melodic Soloists, one artist informed me he would not be able to submit in time his track so I went browsing myspace and noticed a comment from this "Guitarsnake" on my artist page. He hooked my attention as he was endorsing the same guitar brand as me, so I was curious and ran his player. His music was perfectly in phase with the compilation. (lol) It was like Oh, I want this guy!. Nicolas was also enthusiastic and very professional. Later, he contacted the label for the release of Around The World. I think the video clip of Around The World convinced me this guy was totally committed to his music career. mwe3: Can you say something about the CD titles you've released so far on Mad Guitar Records and about the new planned releases? RC: The label is still emerging, things take place gradually. So far Mad Guitar Records has 4 to 5 albums. If I count the compilation, we have released about 20 different instrumental rock artists which has brought them publicity. Mad Guitar Records aims to release a careful selection of albums that "tell" a story beyond the music or the artists skills. I have a nice compilation project in the works now but this one will take more time. I want the right guys on it and they are all touring, as always, (lol) but I'll be patient. The label is working on Seb Bizeul Band's second release that will be out before the end of the year. Im also planning my second instrumental album recording with the Roo Band. Some tracks are written, others must fit into an artistic concept, moreover I don't want to rush it or interrupt with the gigs schedule and other works. Mad Guitar Records is in talks with several other instrumental rock guitar artists but I don't want to give any names. mwe3: Who are some of your favorite guitarists and bands and what guitars do you favor and why? RC: My fave guitarists today are Danny Gatton, Joe Pass and Scotty Anderson, the Telecaster genius. I tend to like instrumental artists whose playing extends my knowledge of guitar. When I was younger, I was a fan of all the Shrapnel Records stuff. I still like bluesy shredders such as Andy Timmons, Doug Aldrich and Zakk Wylde on the clean channel. For bands, I genuinely enjoy a wide range of everything: ZZ Top, Joy Division, pop from the 80s. I love disco, classical masters such as Tchaikovsky, Rachmaninov and I love the movie music composer Danny Elfman. I enjoy jazz; Glenn Miller, Louis Armstrong, Nat King Cole to name a few...the funny covers of Richard Cheese, anything that grooves and has a melody. Guitar wise, I endorse Mayones Guitars. I own two handmade customs called "Legend". I think the guitar fits well my guitar licks mixtures; vintage and modern. I also have a Telecaster, I love Telecasters. Those guitars can play anything, they have soul! mwe3: Are you from Finland and where do you live now? How do you compare music from Finland to other countries? Who are your favorite Finnish musicians? Being you're based in Finland, how about Pekka Pohjola? RC: I am French native and I settled in Finland eight years ago. The country has a strong metal culture with countless bands and festivals. Jazz also finds an audience there which is great. I live in Helsinki which is a place I love. It is a small world here, everybody knows everyone. The down side is that there are almost more bands then people to listen at them. A lot of competition is good though and that way emerges world class bands able to export themselves. My favorite Finnish musicians are Mr. Fastfinger (aka Mika Tyyskä) who is a friend and Elias Viljanen (Sonata Arctica) I don't know him so well. He is a busy man but I would love to have him involved somehow in a project. I like also The Mutants, an instrumental band, not actually guitar oriented at all but surely the most infectious live band I've seen for a while. I must say I don't know much about Pekka Pohjola, hopefully no one will take offense but he was, for sure a huge artist. mwe3: Can you say something about your involvement in playing on the Guitarsnake album? RC: Nicolas invited me. He is not only a great musician but a great guy! There is a cool guitar battle on that song "On The Road" with 6 guitarists! It was not about shred, it really sounds like the guys are jamming together. I think it is good to involve other artists on a record, as long as there is an artistic purpose. That way you increase connections in the business, reach new fans and have fun at the same time!